Google Product Search (formerly known as Froogle) added an option to restrict the results to sellers that offer free shipping. If you enter your location, the service also shows tax and shipping information for some of the products. 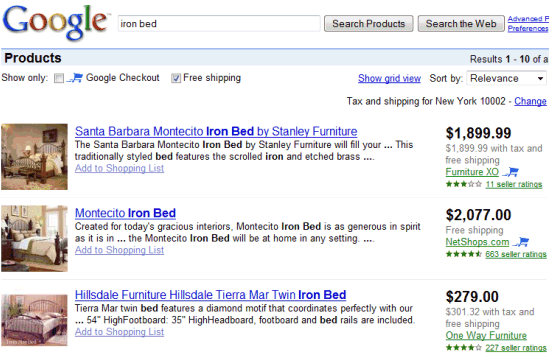 A recent post from the Google Base blog informed sellers that they can submit tax and shipping information. "We'll soon be displaying this information on Google Product Search to provide buyers with more accurate price information, so we strongly encourage all merchants to start submitting it." In case you are wondering, Google Base is a low-profile service that lets you upload structured data. Google uses the data about products in Google Product Search and the real estate listings as a refinement option in Google Maps and the main search results, but I find it surprising that Google doesn't use the data in expanded snippets. I didn't know this existed, awesome. Great info and features that I wonder if I'll ever use. I don't think I've used product search since before the name change. When did that actually happen anyway? If I remember correctly the product search doesn't appear as a main option on the home page. I need to get the labelof free shipping on my product listings. Tried under settings section >> Tax & Shipping. If you are using a Feed. Create a field called "shipping" and enter "US:::0.00" for all products that are free shipping. This code may differ based on region. Visit the Google Product Search support for more help.